Hollywood superstar and former California governor Arnold Schwarzenegger underwent heart surgery today, a slightly frightening medical prospect that in no way hindered his ability to treat fans to takes on their favorite lines from his hit blockbuster movies. “I’m back,” Schwarzenegger—who’s currently reported as being in stable condition—apparently said as his first comment after coming out of surgery, in what was presumably both a reference to his famous Terminator catchphrase, and also a testament to how committed this man is to his own personal bit. 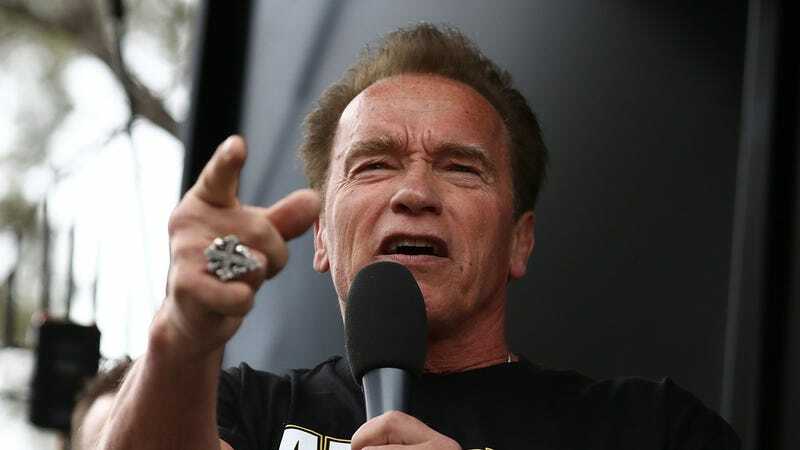 Although TMZ reported the procedure as emergency heart surgery, the Schwarzenegger camp clarified that this was actually a scheduled, less-invasive procedure to replace a temporary heart valve that the actor first had replaced in 1997. An open-heart surgical team was on hand in case of emergencies, but the process was actually done via catheter, rather than the more painful and extreme procedure of cracking the ribs and opening up the chest. Schwarzenegger is apparently doing fine; no word yet on whether he’s also considering getting a biopsy, just so he can bust out “It’s not a toom-ah” today, as well.